Friendly Atheist has a good post asking us all to consider whether we truly support freedom of speech. He is right to note what appears to be considerable hypocrisy around this issue. We pick on Christians for their hypocrisy because it tends to be so common and obvious, but I'd like to remind us that atheists are not immune from making the same mistake. This is a good subject for some discussion in light of the recent news about atheist billboards, bus campaigns, and the like. It is easy to defend one's own freedom to disseminate unpopular ideas (e.g., atheism). However, someone who supports freedom of speech must recognize that this freedom applies to those with whom we disagree as well (e.g., Christian extremists). To defend my right to free speech while attempting to interfere with theirs is a clear example of hypocrisy. Are some atheists guilty of just such hypocrisy? Perhaps. Consider the atheist billboards slowly appearing in some American cities. I think it is safe to say that most atheists support erecting such billboards, and even those who do not are likely to become upset with what looks like censorship when they are taken down. But does not defending this in the name of free speech also require us to endure the most absurd Christian extremist billboards we can find? If we are really serious about free speech, we must recognize theists' right to erect billboards promoting their beliefs. We can respond to them, correct the misinformation they contain, produce our own alternatives, encourage discuss around them, etc., but we cannot seriously call for their removal without betraying our own hypocrisy. This can sometimes be a fine line to walk. 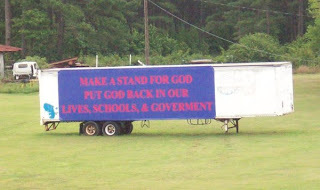 Suppose a Christian extremist raises a particularly objectionable billboard. This is their expression of free speech. You may complain loudly and often, as this is your expression of free speech. Where the trouble begins is when someone with the power to do so acts on your complaints and removes the billboard. This is what we all have a stake in avoiding. It is clear to me that many Christians have a double-standard when it comes to free speech. They embrace their freedom to spread their god delusion while opposing our attempts to normalize atheism and promote a secular worldview. Their rationale is simple. They believe that their delusion has beneficial effects on society and that any alternative is harmful. Atheists are not immune to making the same mistake and often for the same reason.